eCopy Support is in tandem with Nuance and 5thNK.com. Nuance direct support phone number is 888 201 1400 option 2 option 2. The number to 5thNK.com support is 206 452 3331. Once you have purchased support it starts on the day your support contract ended; meaning it does not start on the day you buy it. This is important because it could be you need to buy a quantity of 2 years of support rather than one year. 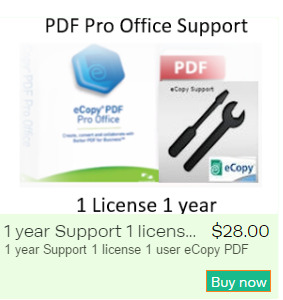 If you do need more than one year of support simply change the quantity to 2, which equals 2 years of support. With support you can upgrade your current version to 6.3 which supports Windows 10. 6.3 Spec sheet go Now! IMPORTANT... We need your product key AKA license key you are buying support for. We can't associate a purchased support agreement to a company name, your name or anything other than the Product key. Buying site is https://ecopysoftware.ecwid.com "you are here now"